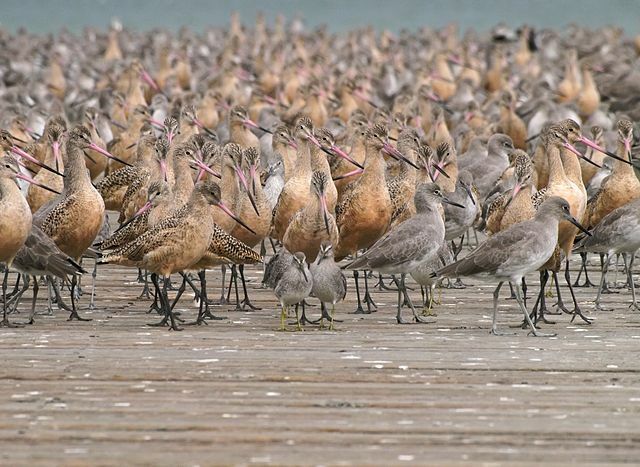 Shorebirds like these gather during high tide at Elsie Roemer Bird Sanctuary in Alameda. Photo by Ingrid Taylar, Wikimedia Commons. Tucked away on the eastern end of Crown Memorial State Beach stands a small pickleweed salt marsh. This morning, eleven birdwatchers and I gathered to enjoy the winter shorebirds and celebrate local conservationist Elsie Roemer’s birthday and birding legacy. The marsh was teeming with birds in every shade of brown and gray. Stately marbled godwits and long-billed curlews loomed above dunlin, sanderlings and sandpipers, manic flocks emitting their cries. Periodically, the birds took off in well-synchronized squadrons, turning and flashing -- first dark, then light -- in quick succession. This maneuver was sure to startle and confuse any predators who might be waiting for a bird breakfast buffet. You can read more about our winter residents in my blog about shorebirds for QUEST. The raucous call of crows diving at a large bird on the building behind us pointed out the red-tailed hawk. It lingered until the mayhem drove it from on high down to the beach. Then a smaller Cooper’s hawk cackled a startled call as it swooped nearby. Perhaps the red-tail was on the Cooper’s favorite perch, best to scope out the neighborhood and mudflats for a birdy breakfast. Former Alameda resident Elsie Roemer, with us now only in spirit, helped ensure this wonderful salt marsh habitat remained while most of the bay’s marshlands – over 80 percent – were filled, drained, or diked for development like the nearby South Shore Shopping Center. Elsie’s passion for bird watching was kindled late in life, but her enthusiasm impacted many others, especially the young people she mentored. Leora Feeny was among her group, a young mother who moved to Alameda with her family. She helped Elsie with her monthly bird counts that were meticulously submitted to California Department of Fish and Game (now Fish and Wildlife). This group, along with the Golden Gate Audubon, was successful in a lawsuit against the Port that resulted in the new marsh at MLK Jr. Shoreline, an important habitat for resting waterfowl, nesting bird species and burrowing owls. In 1979, some of Elsie’s friends successfully lobbied the East Bay Regional Parks to name the Alameda marshland in her honor. That same year, Golden Gate Audubon created an annual conservation award in her name as well. Leora has been the recipient of the award for her efforts at the Alameda Point least tern refuge. Elsie lived until 1991 when she passed away at home while studying her bird magazines. Currently, the bird sanctuary looks a little barren from efforts to eradicate an invasive species of tall cord grass (Spartina alterniflora) coordinated by the Invasive Spartina Project around the bay. Unfortunately, the success in reducing the cordgrass led to the dispersal of a small but tenacious population of the endangered California clapper rail. The nearest population is now in San Leandro Bay at MLK Jr. Regional Shoreline marshes. Hopefully, plans to re-establish the native cordgrass will bring the clapper rails back to Alameda. In the meantime wintering shorebirds, ducks and terns continue to delight birdwatchers and residents with their numbers. You can enjoy them, too, and may want to participate in the upcoming Audubon Christmas Bird Count, the longest-running citizen science project to track bird populations in the Americas. You also have several opportunities to come along with a naturalist guide to enjoy the East Bay birds along the shoreline or in the regional parks in the coming month.